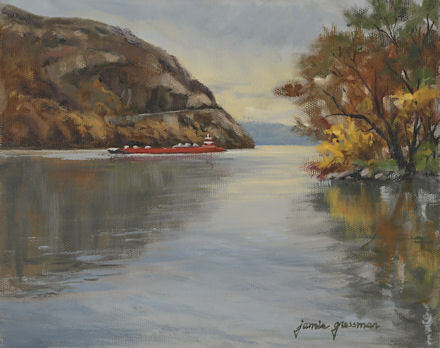 This is one of the paintings that will be in my show at the Hendrick Hudson Library, 185 Kings Ferry Road, Montrose NY. The Opening Reception is this Sunday, September 30, from 3-5pm. If you’re in or around the Hudson Valley, I’d love to see you there! The show will be up until October 28 if you cannot make it to the opening. 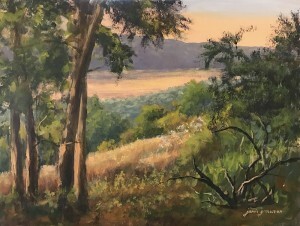 This stunning view of Stony Clove was painted on site from a field on a private estate. Below is an image you can click on for a slightly larger view of the painting. This is one of the paintings that will be in my show at the Hendrick Hudson Library, 185 Kings Ferry Road, Montrose NY. The Opening Reception is this Sunday, September 30, from 3-5pm. 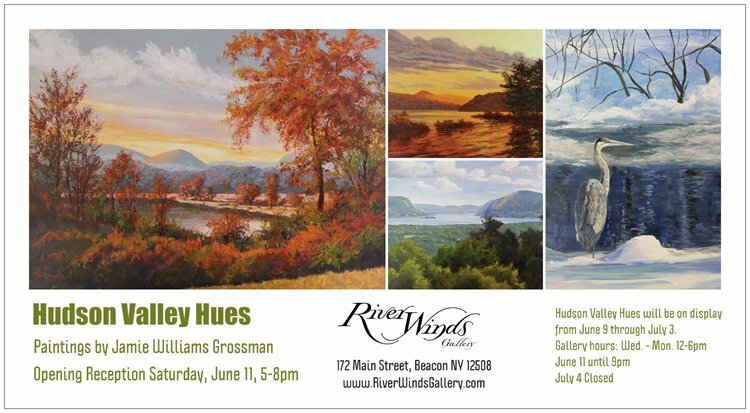 If you’re in or around the Hudson Valley, I’d love to see you there! The show will be up until October 28 if you cannot make it to the opening. I’ve framed up a dozen watercolors for the show, in addition to my oils and acrylics. Yes, it’s really me! I’ve been painting lots of florals lately. Flowers have always been outside my wheelhouse. I’ve painted them in still lifes, in a more realistic/illustrative style, but always felt they were foreign objects that I didn’t really understand. I have the blackest thumb around and can’t even grow them! (Though I am determined to try to change that next year…) I wanted to take on a new challenge this summer as well as do more watercolor work, so I combined the two. 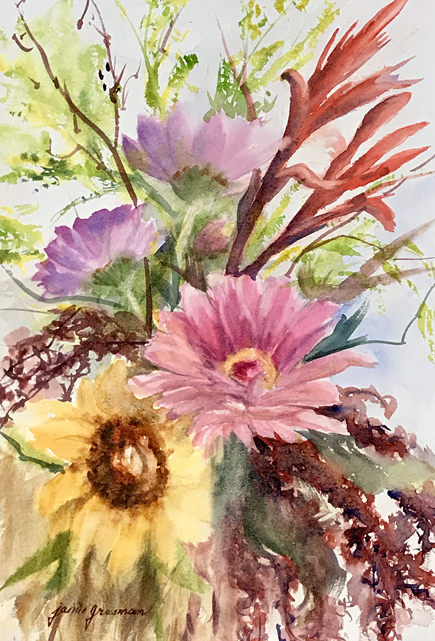 I’ve been purchasing flowers every week, and working toward finding my own expressive style by filling a sketchbook with studies, and doing watercolor paintings from these weekly bouquets. I think I’m really going to enjoy painting florals when the winter chill makes it hard for me to get outside for plein air work. 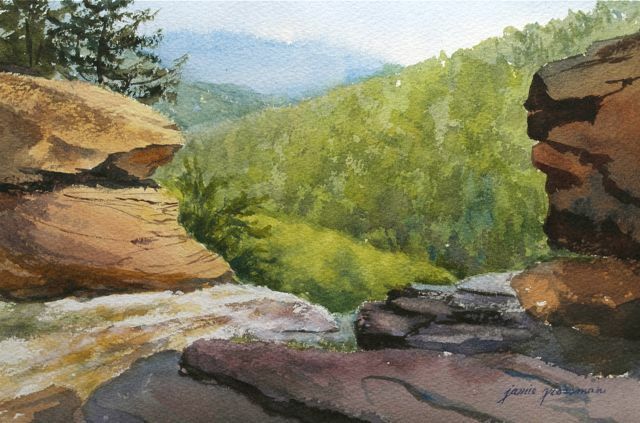 This is one of my favorite spots on the planet to paint, meditate, or just listen to the sound of the rushing water. Serene! Below is an image you can click on for a slightly larger image of the painting. This little oil painting was done in late fall on location. My friend Trish and I hiked out to the boardwalk at Constitution Marsh to spend a gorgeous day out on the Hudson River. The property is an Audubon Preserve, and there are always eagles and interesting wildlife around. I had to pick out a few bugs and do some touchups afterwards, so it’s taken me awhile to finish it up and get it posted. The atmosphere was so quiet that day, with barely a ripple in the water and a cloudless sky. Dreamy! Painting is in a sealed polybag, matted, with backing board. 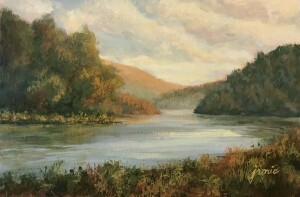 The painting has a custom ivory, archival 12×16″ mat with archival backing, ready to go into any standard 12×16″ frame. 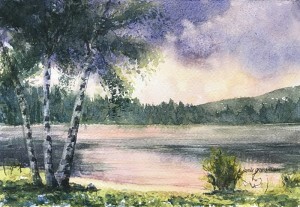 North South Lake is one of my favorite painting spots for birches and atmosphere. In this painting, I got both. 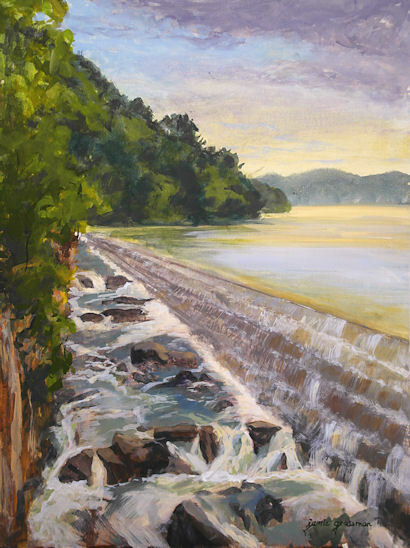 The Hudson River School painters also favored this location. 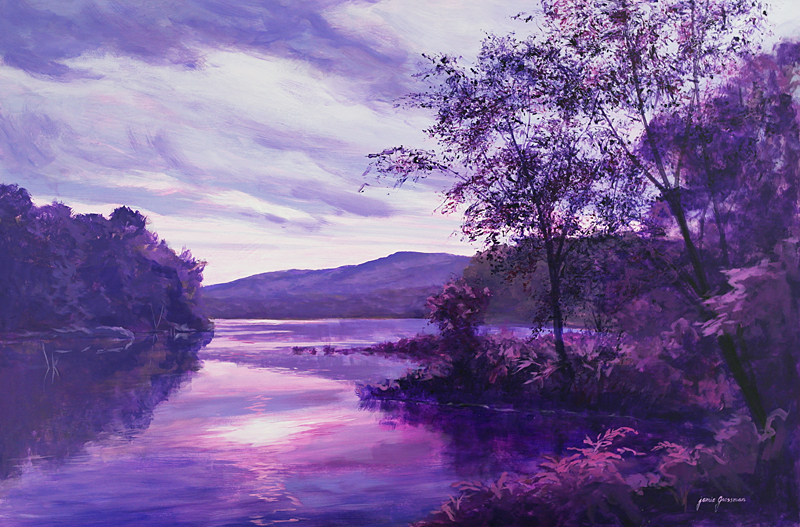 I love the way pinks and violets play together, so I explored that interaction in this painting. You can click the image below for a larger, clearer view of the painting. 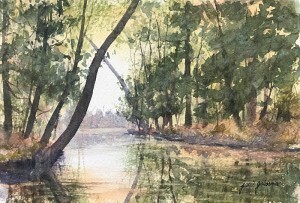 12×16″, watercolor on paper. 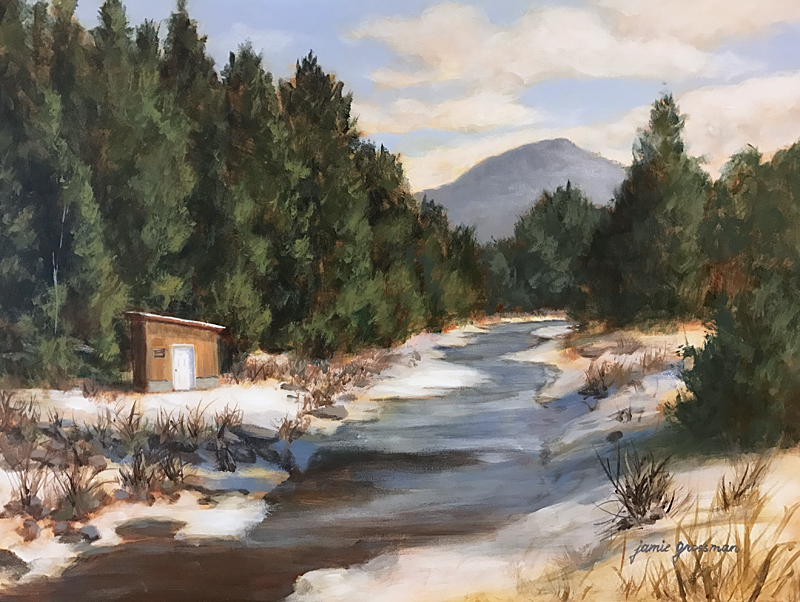 Includes mat and backing board (7 1/2 x 11″ painting size, matted to 12×16″). Will fit any standard 12×16″ frame, or I can frame for you for a small additional fee. 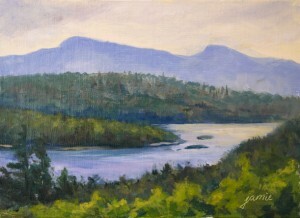 This was painted a couple of weeks ago beside one of my favorite creeks in the Catskills. I can’t seem to stop going there! There are endless compositional possibilities and color harmonies to explore in these quiet, meandering banks. This painting features another atmospheric day at my favorite place for painting atmospheric days — North South Lake! The Great Blue Heron flying over was a nice accent to the dramatic sky. Click the image below for a larger, clearer view of the painting. This painting of a moored boat with dramatic skies was painted from a photo I took a few years ago. 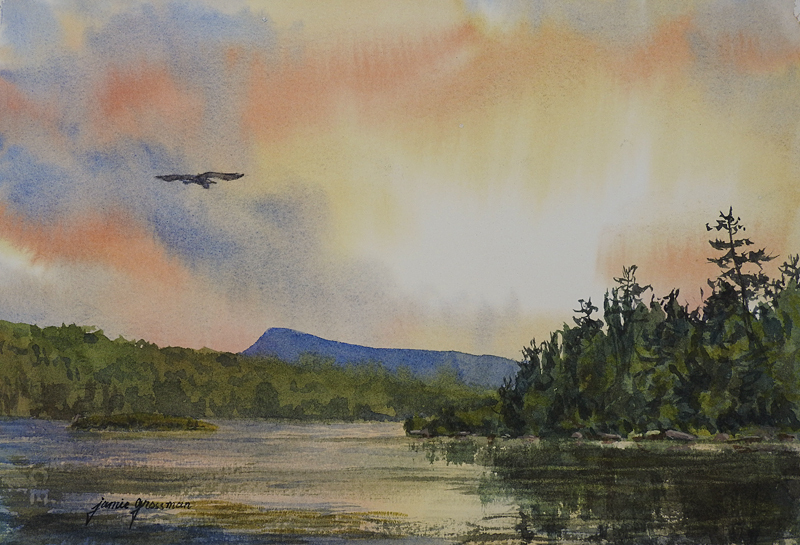 I made several attempts at a watercolor rendition of this scene before coming up with this one, and hope to do more. I like the drama of it, and the way these colors work together. Below is an image that you can click on for a larger, clearer view of the painting. 12×16″ including mat and backing board (7 1/2 x 11″ painting size, matted to 12×16″). Will fit any standard 12×16″ frame. While out hiking in early spring, I came upon this stream with several arched trees extending from the shorelines over the water from either side. 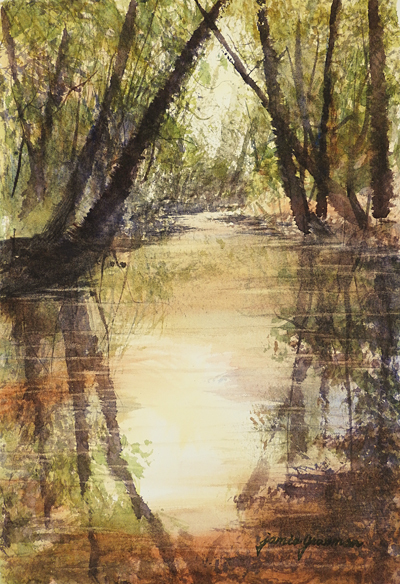 As the creek meandered, the shoreline trees formed arches through the various planes of the scene. I took a lot of photos to do a series of these arched tree forms, and hope to return soon to paint some of them on location. They present interesting compositional opportunities focused on the arches, and reflections in the distance, and/or transparency of the water as it nears the foreground. Below is an image you can click on for a larger, clearer view of the painting. 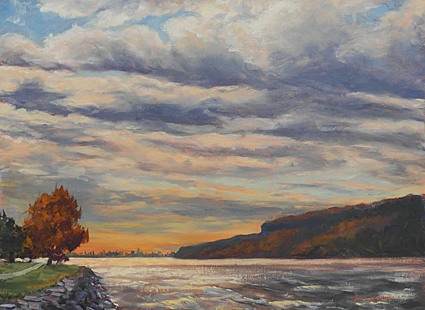 This painting features the fabulous view from the hills above Garrison, looking over West Point, and north through the Hudson Highlands to Bannerman Island. It is a stunning vista at any time of day, but sunsets are magical! Framing available for a small additional cost. I have been wanting to paint this scene ever since I saw it for the first time a few years ago. 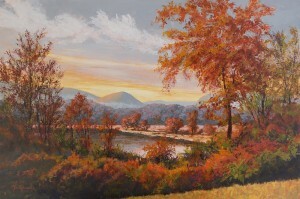 No matter what time of day or season, this view in the Catskills is spectacular. My husband and I drove past a few weeks ago and I took some photos. During the big snowstorm last week, I started the painting; it seemed appropriate! I’d like to do a large format horizontal of this view also….someday. Below is an image that you can click on for a larger, clearer view of the painting. I love this scene and have been playing with it in various color combinations for nearly two years. There are so many ways to interpret the composition in terms of light, season, focal point, and color palette, that I can’t seem to get tired of it! It’s a view of the lake at Innisfree Gardens. This most recent rendering is in fall colors, with the late day light striking the eastern hillsides and distant mountain before sunset. Below is an image you can click on for a slightly larger view of the painting. It’s not often that I find a vertical composition I really like of a Boscobel scene. 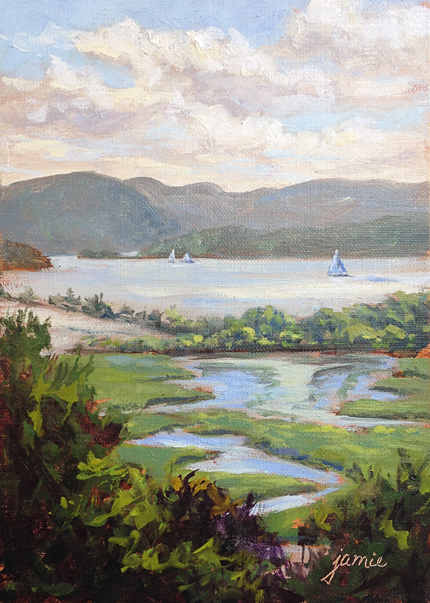 I usually paint that vista in a panoramic fashion, but the path of the marsh channels works well this way too. Maybe there is a new series of verticals coming!It would certainly be a different way for me to explore this landscape that I’ve been painting for so many years. This was painted on location at Boscobel Restoration in Garrison, New York, toward the end of one of those stellar, long, summer days. The scene overlooks Constitution Marsh and the Hudson River. Helicopters were flying overhead in formation from West Point as I painted! 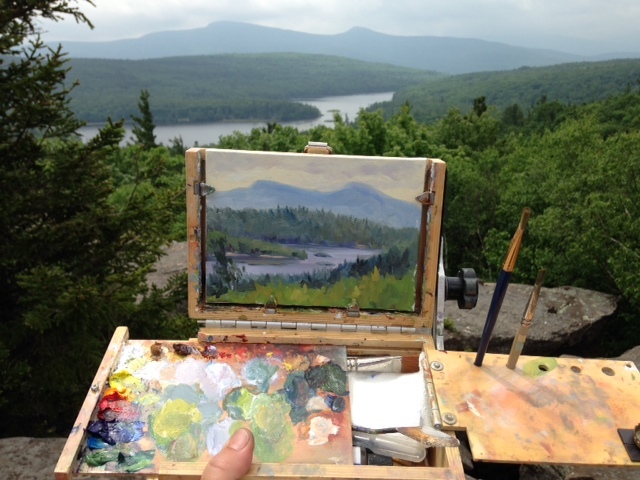 I spent a magical day painting at Boscobel. The weather was ideal, and a huge buck was staring at me from the distance. (Expect to see a painting of him soon!) There was tug and barge traffic out on the river, helicopter formations flying overhead from West Point, and good company with other artists. It’s hard to beat a day like that. Below is an image you can click for a larger view of the painting. My husband and I were out hiking on a beautiful fall day in the Hudson Valley. 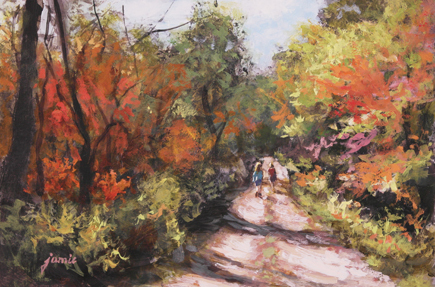 I snapped a photo of this couple walking down the trail, which became a great painting subject. 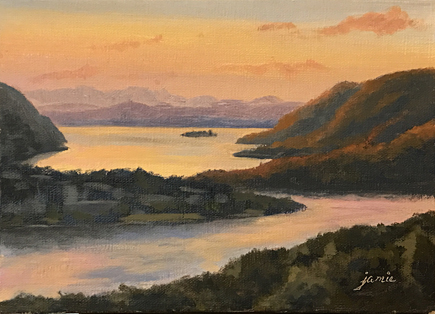 This painting went out to my Hudson Valley Hues solo show at RiverWinds gallery before I had a chance to put it up on my website, and has sold at the show. Thank you, RiverWinds! The show will run until July 3 for anybody who has not yet had a chance to go see it. 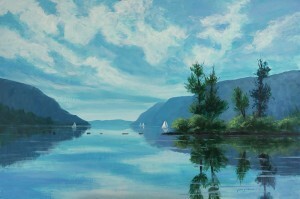 The gallery is at 172 Main Street, Beacon, NY. Gallery hours are Wednesday through Monday, 12-6pm, closed Tuesdays. My husband and I love to go on sunset expeditions with our cameras. This is Croton Point Park near sunset, facing south. 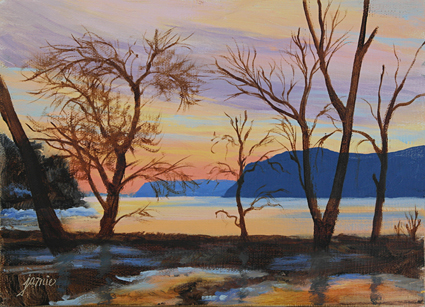 The cold, bare winter trees provided an elegant contrast with the warmth of the colorful sunset. Their graceful silhouettes add so much to the composition, and allow for plenty of color to come through until the spring leaves fill out the forms and obscure the view. This was possibly my last fall hike up to the base of Kaaterskill Falls, one of the Hudson River School painters’ locations that I love the most. 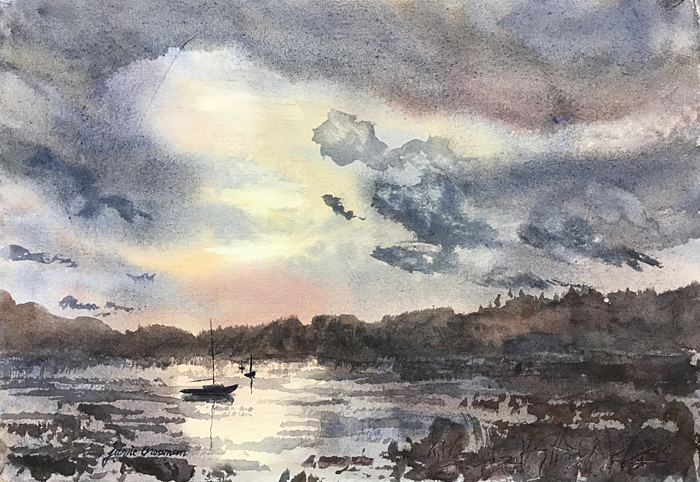 It was a cold day, and I was the last of my painting group to leave the spot. One of the park rangers was up there with me, with occasional hikers coming along to view the magnificent waterfall. I was glad to see they finally had a ranger there to try and dissuade hikers from venturing up the sides of the falls, where two have already died this year. I’ve done so many paintings up here, but I think this was the first time I did a 2:1 ratio at this spot. I really like the way it works with these proportions. I think this layout gives a truer impression of how tall the falls are. 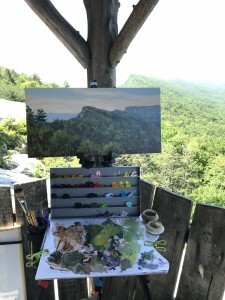 Rain threatened on the day I ventured out to do this painting, but we hiked up to Newman’s Ledge anyway, and then settled in for lunch and some painting time at Sunset Rock. 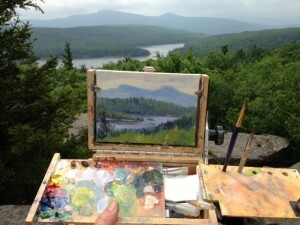 This was a favorite painting spot of the Hudson River School artists, and I think you can see why. Kaaterskill High Peak and Round Top mountains are in the distance, with North South Lake stretched out below. We figured we’d be able to spot the rain coming in from the west before it got to us, and we headed down the mountain when the front started moving in.